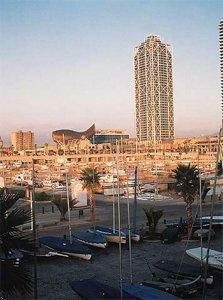 Choose from our wide selection of hotels located in and around Barcelona. Whether you’re looking for budget hotels, resorts, or luxury hotels, you’ll find the best accommodations at the best prices. Stop wasting time and make your reservations online now! Brand new 4-star hotel in the best possible location in the city centre. Opened 2003 in the area of Placa Catalunya. It occupies a neo-classical building from 1888. The renovation is based on modern soft design. The beautiful decoration and the variety of facilities make the Atrium one of the best 4 star hotels in town: 71 rooms with air conditioning, heating, mini bar (with some free drinks), 2 telephones, the most modern interactive TV, free wireless internet, wooden sauna, a small fitness centre, an art gallery and a business centre with computers and a library. It has 141 fully equipped soundproofed rooms, designed so that you can be sure of your up most comfort. Five of the rooms and all of the public areas have been especially designed making them easily accessible for any disabled guests. There are eight meeting rooms available with capacities from 20 to 250 people, as well as a board room, equipped with state of the art audiovisual resources. The Gran Hotel La Florida is perched above the city of Barcelona, offering breathtaking and panoramic views of the city. Set amidst the Collserola nature park, the hotel makes for a tranquil retreat. At the same time the hotel is located conveniently close to the city centre and the international airport. Gran Hotel La Florida cannot be better described than by the term "Urban Resort" offering breathtaking and unbeatable views over Barcelona and the Mediterranean Sea. Located near the Airport and the Business Area of the Baix Llobregat, The Hesperia Sant Just Hotel is only 5km to the centre of Barcelona and to one of the main Avenue's (Diagonal Avenue). The Hesperia Sant Just Hotel has 150 double rooms with full marble bathrooms, king size beds, hair dryer, air conditioning, TV with satellite channels, interactive system for messages, wake up call, hotel information, satisfaction guest questionnaire, pay*TV and radio, mini bar and safety deposit box. A distinguished member of design hotelsTM.Hotel Claris architecture treats history with abundant respect while still progressing along entirely new paths. Only the Belle Epoque façade still remains of the grand urban house originally built in 1892 as a Verduna Palace. On the ground floor, solid glass window walls allow passers-by a fascinating view of the lobby with its steel, copper, glass and concrete design. 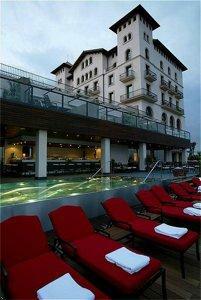 The building of the hotel, the work of the architects C. Ferrater and J.M. Cartañá, won the National Prize for Architecture and Construction for 1992-1993. Inaugurated by the King and Queen in 1992, shortly before the Olympic Games, the hotel is a faithful exponent el the "new frontier" of the hotel sector in Barcelona. 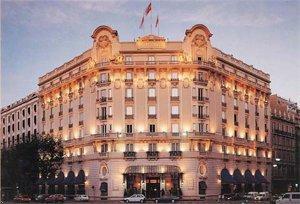 Ever since 1919 the Hotel Palace has been a symbol of tradition, elegance, style and service. It is located in the heart of Barcelona, on a pleasant tree lined boulevard in the most commercial and financial area of the city, close to the historic gothic quarter, to the sea front and to all major points of tourist interest. 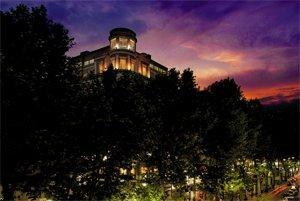 Your Barcelona experience starts at Le Meridien Barcelona. Located in the very centre of town on the world-famous Las Ramblas, our hotel is just minutes away from everything that makes Barcelona one of Europe's most exciting cities. Enjoy our spacious guest rooms, superb service, and suites with unique views of the Barrio Gótico. Located in the shoppers paradise avenue Passeig de Gracia, next to several masterpieces by Gaudi and designers boutiques, it is within walking distance to the Rambla and Plaza de Catalonia. The neoclassical facade of 1918 waits an interior brimming with contemporary art. The Royal Hotel is a superior first class hotel with a privileged location right in the city center, on the well-known "Las Ramblas" boulevard close to the Catalunya Square, the meeting point for business, entertainment and culture and a symbol of its openness and cosmopolitan character. The hotel is within walking distance to the most fashionable area for tourism and shopping, like Gaudi's Tour, Gothic Quarter, Picasso's Museum, Olympic Marina and Liceu Opera House. Overlooking the Mediterranean from its unique position in the Olympic Village next to the marina, The Hotel Arts Barcelona embodies the rich history and spirit of Spain's foremost Catalan city. 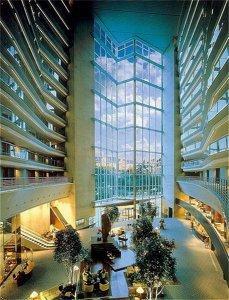 Its striking silhouette has made the hotel a symbolic building of the new Barcelona.